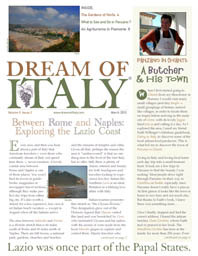 Italy’s most famous butcher Dario Cecchini (who we profiled in 2004) put Panzano in the map. Judy Witts Francini stops by Panzano to see how Dario has expanded his empire and what other treasures Panzano has to offer. The authors of a new book on agriturismi in Northern Italy say this agriturismo in Piemonte is a winner, not only for ambiance but for its food. Plus a great recipe.